Pensions have now become firmly placed at the top of the trade union agenda, but not in the usual way of seeking improvements. This time it is to defend them from attacks by both employers and the government. Many, including some trade unionists, have been willing to accept the myth of a "pensions crisis" caused by people living longer and the lowering of the birth rate. Surely in a modern society we should be welcoming the fact that people are living longer, and population projections taking this into account have always been used to calculate the basis for our pension schemes. The class should not be taken in by spurious population arguments – it is really an issue of what we want our taxes to be spent on. The EU wants more money and the government is using an EU directive to try and get it by robbing public service workers of their pensions. The specific issue affecting the Local Government Pension Scheme is the government proposal to remove the benefit of the "rule of 85", which allows employees who are 60 or over to retire if their age and years of service added together amount to 85 or more. The directive in question is 2000/78/EC, which requires Britain to remove any practices which can be considered age discriminatory. It gives the government the justification it needs to attack the rule of 85. This was also confirmed by an official from the office of the Deputy Prime Minister who said – addressing a conference organised by the TGWU and GMB in Eastbourne in December – that it was not the regulations being brought in by government that meant the rule of 85 had to be removed, but the European Directive. So there we have it from the horse's mouth: if Britain were not in the European Union there would be no need to remove the rule of 85. The proclaimed reason for this directive was to prevent discrimination against older workers; its effect, of course, is the opposite. One delegate in Eastbourne, when questioning Prescott's official, asked why the same principle against supposed age discrimination was not being applied to the lower minimum wages for those between 16 and 21 years of age, the voting age, and for that matter the pensions of MPs. The reply was that it was out of his remit! This is not the only European directive that has resulted in a lowering of terms and conditions. Recently an attempt was made to replace an Irish ferry crew with a crew from Eastern Europe on far worse terms and conditions, and workers in the food industry face the same (see News, page 3). Instead of offering to return part of Britain's rebate, Blair should be returning the blue flag with stars on it and withdrawing Britain from the EU. The trade unions have reacted angrily to the announcement to parliament by Phil Woolas, a minister in Prescott's department, that the government would move to scrap the rule of 85 while staying silent on replacing it with a benefit for all. The Community and Youth Workers Union and Unison have already sanctioned a ballot for industrial action if needed, and the other unions involved are expected to follow suit. Trade union members must make sure that the negotiators in local government do not fall for the same trick that the Public Services Forum did, namely just protecting current members. They must campaign for a replacement that will apply to all. The Public Services Forum agreement with the government is now coming under attack and rightly so. While some trade unions and their negotiators can hold their heads high for opposing the deal, the same cannot be said of the majority. Where would our class be today if our predecessors had had the same attitude to negotiations as these did? It is the responsibility of all who take up positions to represent our class that they take a class perspective with them and don't just look at the present members, but also to the future generations, and ensuring that they have decent terms and conditions including pensions. The Natfhe national executive has recently condemned the deal and made a stinging attack on those who approved it by passing two motions, the first one condemning the deal and the weakness of the unions' response. The second goes on to say, among other things, that the current proposals are divisive and will create a two-tier workforce, that had our predecessors not fought for our pension rights we would now have nothing to defend, and that the union should continue to campaign and fight for the right for all members to retire at 60 on full pension. Natfhe went on to urge the executives of PCS and NUT to reconsider their decisions. Natfhe's NEC has got it right in arguing a clear class line – what a pity that this may be too late to overturn the ratification of the agreement. But if Labour tries to unpick it to make it worse, we might well consider unpicking it to make it better. 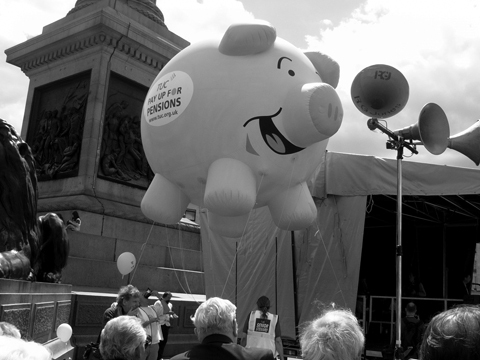 TUC fight for pensions? Pigs might fly. But gas workers and others are showing the way. It is not just in local government that attacks on occupational pensions are being fought. Gas engineers who are members of the GMB have returned an 80% vote in favour of strike action over the decision to close the scheme to new starters. Four days of strike action in December and two in January are to be backed up by a ban on out-of-hours cover between 12 and 23 December and 4 and 10 January. The GMB members and officers involved should be congratulated on the stance they are taking. Their action shows that those who have been arguing that members would not vote for action over future employees' rights are far removed from their members and therefore the class. This dispute shows that workers are not so lacking in consciousness as low as some think. It also shows that if all the unions had continued to support the retirement age of 60, opposed the two-tier system, and then given the leadership, information and trust, the whole of the trade union movement could have been mobilised to defend the schemes not just for current members but also future ones. Anyway, better no agreement than the shameful one negotiated for the public services. It really does take some believing that the TUC and some trade union general secretaries can hail that agreement as the greatest victory for trade unions since the war. Another union whose members have voted by over 90% to take industrial action over plans to close a pension scheme is Amicus. Members based on the Wirral are taking action after a take-over of Typhoo by Apeejay Surrendra (an Indian company) in October. The take-over resulted in proposals to close the scheme and replace it with a money-purchase scheme without consultation, according to the union. If anyone thinks that this round of talks over occupational pensions will mark the end of the government's intent then they must think again. If the pension age is increased to 67 or 69 then it will not be too long before they come back again to raise the age for retirement. That is why the Local Government Pension Scheme negotiators have a responsibility to the class to fight against a two-tier system and to retain the ability to retire at 60 with no reduction and no extra cost. How can unions recruit new members in local government, having just agreed they will have second-class pension rights? Unions are about nothing if not unity of workers. If this battle can be won then that would be a victory for the class worthy of praise instead of the condemnation that rightly has been delivered to the Public Services Forum by Natfhe's national executive.